Ayn Rand was one of the best known atheists of the twentieth century. Unlike many non-believers who find much to commend about religion, Rand’s evaluation was almost entirely negative. In this respect she was ahead of her time and has more in common with today’s “new atheists” such as Daniel Dennett and Richard Dawkins. Rand’s typical shortcomings in argument are magnified when it comes to the philosophy of religion. Unlike her writings on ethics and epistemology (where she showed at least a moderate acquaintance with its subject matter and familiarity with some representative thinkers), it doesn’t appear that Rand had even a superficial knowledge of religion or even a passing familiarity with thinkers such as Augustine, Luther and Calvin. The one religious thinker she admired, Thomas Aquinas, is never quoted. Her interest appears more in critiquing its ethical teachings and psychological implications than in the arguments theologians put forward for its metaphysics and epistemology. Even here, her interest was quite narrow, being generally limited to contemporary and medieval Catholicism. She devoted two essays to recent papal encyclicals. In "Of Living Death," she critiques Paul VI's encyclical Humanae Vitae (which opposed artificial contraception) and in "Requiem for Man" she critiques his Populorum Progressio (a discussion of economics). When she discusses religious ethics, she seems to think they are universally synonymous with the worst excesses of medieval asceticism. Not only does Rand use the term mysticism to describe all religions, but uses it to encompass theories that almost never fall within the common definition of religion. For example, she considers Marxism and racism to constitute forms of mysticism. Avowedly secular thinkers such as pragmatists and logical positivists are "neo-mystics." (Rand, Philosophy: Who Needs It, p. 64.) It might be hard to find a non-Objectivist system of thought that Rand did not consider mysticism or at least "neo-mysticism." Even Ludwig von Mises was a "neo-mystic" who engaged in "whim-worship." (Mayhew, Ayn Rand’s Marginalia, p. 147.) Rand is entitled to reject the arguments for religion or logical positivism, but she isn’t entitled to rule them out of court by a type of philosophical guilt by association. Nowhere in Rand’s corpus do we find any attempt to support this diagnosis with evidence. I doubt that Thomas Aquinas, Ludwig von Mises and Karl Marx experienced such a psychological crisis point in their childhood, but as can be seen from Rand’s diaries published in James Valliant’s The Passion of Ayn Rand’s Critics, Rand put great stock in her psychoanalytic abilities. When Rand actually gets around to critiquing the metaphysics and epistemology of religion, her results aren’t impressive and more often than not rest on poorly thought out arguments and misunderstandings. For example, in Atlas Shrugged, she claims that theism is contradictory: “God is that which no human mind can know, they say—and proceed to demand that you consider it knowledge.” (Rand, For the New Intellectual, p. 149.) Rand’s description may describe Gnostics and some types of mystics, but certainly doesn’t represent mainstream theists, most of whom believe that God may be known (albeit not exhaustively). For those who are interested in Rand’s (and Leonard Peikoff’s) abilities as critics of theism, I recommend the essays by Stephen Parrish and Patrick Toner in the Spring 2007 Journal of Ayn Rand Studies. "On Rand's view, a person is perfect when he does his best"
- Tara Smith p. 238, Ayn Rand's Normative Ethics: The Virtuous Egoist. In the last ten years or so, a number of books have come out examining the role of intuition (i.e., unconscious thinking) in human cognition. These include Blink, by Malcolm Gladwell, Intuition: It's Powers and Perils, by David Myers, Strangers to Ourselves: Discovering the Adaptive Unconsious, by Timothy Wilson. Guy Claxton's Hare Brain, Tortoise Mind may very well be the best of the lot, mixing, as it does, shrewd analysis with detailed evidence. The general picture of unconscious thinking that emerges from Claxton's book is devastating to some of Rand's most critical epistemological and psychological pretensions. Orthodox Objectivism insists that the unconscious (or "subconscious") cannot originate any thoughts or motives on its own. "There is nothing in the subconscious besides what you acquired by conscious means." This view, in light of evidence provided by Claxton, is wildly implausible. In Hare Brain, Tortoise Mind, Claxton distinguishes between two main modes of thought: what he calls "d-mode" (i.e., deliberation mode) and "unconscious intelligence." Claxton's d-mode is conscious, deliberate, purposeful thinking—in other words, the sort of rational thinking favored by Rand. Unconscious intelligence, on the other hand, goes very much against the grain of Rand's cognitive ideals. It lacks many, if not all, the characteristics of d-mode. It is much closer to Michael Oakeshott's practical knowledge, discussed in an earlier post. The greater part of the useful understanding we acquire throughout life is not explicit knowledge, but implicit know-how [writes Claxton]. Our fundamental priority is not to be able to talk about what we are doing, but to do it—competently, effortlessly, and largely unconsciously and unreflectingly. And the corresponding need for the kind of learning that delivers know-how—which I shall call learning by osmosis—is not one that we outgrow. The brain-mind's ability to detect subtle regularities in experience, and to use them as a guide to the development and deployment of effective action, is our biological birthright.... Yet we ignore or disparage ... [unconscious intelligence] at our peril, for it turns out that there are things we can learn through this gradual, tacit process which d-mode cannot master; and also that d-mode, if used over-enthusiastically, can actively interfere with this way of knowing. Rand detested intuitive ways of knowing, equating them with "mysticism," which she defined as "the claim to some non-sensory, non-rational, non-definable, non-identifable means of knowledge, such as 'instinct,' 'intuition,' 'revelation,' or any form of 'just knowing.'" [PWNI, 75] Now while intuition (unconscious thinking) is not non-sensory, (nor is it a form of revelation), it is non-rational and non-definable and, in the anti-foundationalist sense of the term, non-identifiable as well (because it is non-verbal). Rand's dislike of any cognitive conclusions that did not pass through the conscious mind is further emphasized in Peikoff's insistence that the unconscious "is simply a repository for past information or conclusions that you were once conscious of in some form, but that are now stored beneath the threshold of consciousness." Peikoff's statement, made in Rand's presence during his lectures on Objectivism, is tantamount to a denial of unconscious intelligence. "If we see d-mode as the only form of intelligence," warns Claxton, "we must suppose, when it fails, that we are not 'bright' enough, or did not think 'hard' enough, [or 'focus' hard enough, as Objectivist might declare,] or have not got enough 'data.' The lesson we learn from such failures is that we must develop better models, collect more data, and ponder more carefully. What we do not learn is that we may have been thinking in the wrong way. " Drawing on extensive experiments in human cognition, Claxton suggests that we should take steps to rehabilitate unconscious intelligence, which involves, not denigrating d-mode intelligence, but supplementing it with "sources of knowledge that are less articulate, less conscious and less predictable... The crucial step in this recovery is not the acquisition of a new psychological technology, but a revised understanding of the human mind, and a willingness to move into, and to enjoy, the life of the mind as it is lived in the shadowlands rather than under the bright lights of consciousness.... The key to [unconscious intelligence] is not an overlay of technique but radical reconceptualization. When the mind slows and relaxes, other ways of knowing automatically appear." Claxton's view is nearly the opposite of Rand's. Where Rand emphasizes focus and precision, Claxton argues (and supports with scientific evidence) the need for mental relaxation and tolerance for " information that is faint, fleeting, ephemeral, marginal or ambiguous." And unlike Rand, who denigrates unconscious forms of knowing, Claxton does not denigrate d-mode. He only points out that it has both strengths and weaknesses, and that if the individual wants to make full use of his intellectual capacities, he must draw on intuitive forms of knowing as well. "D-mode works well when tackling problems which can be treated as an assemblage of nameable parts," points out Claxton. "But when the mind turns its attention to situations that are ... too intricate to be decomposed in this way without serious misrepresentation, the limitations of d-mode's linguistic, analytical approach are quickly reached." There is no book that does a more convincing job of going to the very heart of what's wrong with Rand's view of cognition. Rand's contention that "Reason is man's only means of grasping reality and acquiring knowledge" is a libel against the mind. Claxton, making use of some of the most fascinating experiments in cognitive sciences, shows us why intuition is necessary compliment to d-mode reasoning. Rand's essay "The Objectivist Ethics"is well-known, and the simple, decisive arguments against it - like her equivocation between "survival" and "survival as man qua man", and her deficient understanding of the is/ought problem - are now becoming equally well-known. However a shorter and lesser known essay, "The Ethics of Emergencies", throws other light on fundamental problems with both Rand's ethics and her typical style of argument. Over the next few weeks we will do a "slow read" on this piece, para by para, and unpack in detail the plentiful intellectual and stylistic confusions therein. The psychological results of altruism may be observed in the fact that a great many people approach the subject of ethics by asking such questions as:"Should one risk one's life to help a man who is: a) drowning, b) trapped in a fire, c) stepping in front of a speeding truck, d) hanging by his fingernails over an abyss?" Comment: This opening is vintage Rand. For despite her authoritative tone, Rand knew next to nothing about psychology, and sometimes chided Nathaniel Branden for even being interested in such an ultimately irreducible subject. Yet despite her ignorance, and perhaps because of this convenient irreducibility, she nonetheless regularly enjoyed draping her arguments in pseudo-psychological trappings*. This penchant for armchair psychology is mostly risible: for example, in "The Cult of Moral Grayness" Rand declares that the order in which people commonly say "good and evil" and "black and white" is, apparently, "...interesting psychologically." One is tempted to reply that the only thing interesting psychologically is that Rand finds this interesting psychologically. Similarly, here we find her whimsically inferring the "psychological results of altruism" on society at large from existence of a commonplace "what if"? She clearly never read Freud on the cigar. (Stylistically we also have the glitch of her clumsy set of examples. For we really need only "drowning"; we do not need the ramping melodrama of the other three redundancies, nor the attempt to itemise this padding into significance). 1. Lack of self esteem - since his first concern in the realm of values is not how to live his life, but how to sacrifice it. 2. Lack of respect for others - since he regards mankind as a herd of doomed beggars crying for someone's help. 3. A nightmare view of existence - since he believes that men are trapped in a "malevolent universe" where disasters are the constant and primary concern of their lives. 4. And, in fact, a lethargic indifference to ethics, a hopelessly cynical amorality - since his questions involve situations which he is not likely ever to encounter, which bear no relation to the actual problems of his life and thus leave him with no moral principles whatever. Comment: Perhaps we should really consider the implications of Rand's approach here. For, from the mere utterance of an ethical chestnut, she is claiming to have diagnosed the utterer's psychological state as suffering from a "lack of self-esteem", "lack of respect for others", "a nightmare view of existence", and "in fact, a lethargic indifference to ethics, a hopelessly cynical amorality..."If there was any doubt that Murray Rothbard's parody "Mozart Was A Red" - where Mozart's "collectivist", "anti-life"psychology is implied by "every bar of his music" - accurately reflected the Randian method in action, this gives us a perfect example in her very own words. We should also pause to reflect on 4., where she criticises the above ethical questions for being situations one is "not likely to encounter" and thus leave us with "no moral principles whatever." Yet this is the very method she uses elsewhere to capture the "essence" of altruism; by the use of a reductio ad absurdum to claim, for example, that "death is the ultimate goal and standard of altruism." Of course, we are hardly likely to encounter death as a result of a typical altruistic act. What, according to Objectivism, our moral status will be should this unikely event occur we will attempt to discover as we read on. *She also indulged in lengthy, pseudo-psychological introspective ramblings herself, as is excruciatingly exhumed in the end section of James Valliant's hapless hagiography "The Passion of Ayn Rand's Critics". Murray Rothbard's infamous parody of the Randian inner circle, performed in honour of his 60th birthday. Moralism. The most regrettable aspect of the Objectivist Ethics is its moralism, its mania for pronouncing moral judgments. Rand did not beat around the bush on this issue. "One must never fail to pronounce moral judgment," she vociferously declared. The operative word here is pronounce. If all Rand meant by the insistence on moral judgment is that the individual should evaluate whether this or that individual constitutes a threat or danger, there would be nothing to object to. Simple prudence dictates that we have to be on the look out for people that can harm us. But this is not merely what Rand had in mind. In addition to prudential evaluation, she wanted specific moral pronouncement. It was not enough for Rand to quietly say to herself, "I have evidence that Jones lied; therefore, I can't trust Jones." Nor could she content herself with merely warning her friends about Jones' mendacious tendencies. No, she had to come and out and pronounce moral judgment on Jones. What is gained by such pronouncements? Except in extreme cases involving terrible crimes (murder, torture, mass killings, etc. ), running around morally judging and condemning people is entirely pointless. Nothing is gained except the resentment of the condemned. Indeed, if anything, such moralistic grandstanding, by antagonizing potentially dangerous people, only puts oneself at greater risk. If you really think a person is "evil," the last thing you want to do is give that person a reason to resent you. By all means, warn your friends and loved one; be on guard against him; but don't antagonize through the use of morally charged rhetoric. Not only does pronouncing moral judgment potentially harm the pronouncer, it hardly ever does anything for the person judged and condemned. When a person is condemned morally, they either shrug it off or become defensive and hostile. They hardly ever agree with their condemner. When was the last time you heard someone who had just been morally condemned say, "You know what—you're right, I am evil. I'm going to punish myself by dangling my organism by its testicles from the nearest lamppost"? What makes Rand's moralizing particularly senseless and irrational is the triviality of its occasions. Rand and her orthodox followers have made a specialty of morally judging those they disagree with. So it's not merely what a person does that is important. An individual may be entirely inoffensive—never harmed anyone in his life. But if he occasionally indulges in some rather odd speculations, he deserves to be morally judged! So if he spends his spare hours trying to bend spoons with his mind, or indulges hopes of reincarnation, or recounts past lives, or is fascinated by the art of Jackson Pollock, or enjoys muddling his way through Hegel and Bradley while whistling to himself Schoenbergian tone rows, or has the epistemological temerity, like most Americans, to believe in God—if he does any of these things he could very well be a candidate for averse moral judgment. That, in any case, is the verdict Peikoff's infamous "Fact and Value" essay. To be sure, Peikoff, following Rand, admits the possibility of "honest errors of knowledge." But such errors are not nearly so common as some people wish to think, especially in the field of philosophy [he insists]. In our century, there have been countless mass movements dedicated to inherently dishonest ideas—e.g., Nazism, Communism, non-objective art, non-Aristotelian logic, egalitarianism, nihilism, the pragmatist cult of compromise, the Shirley MacLaine types, who "channel" with ghosts and recount their previous lives; etc. In all such cases, the ideas are not merely false; in one form or another, they represent an explicit rebellion against reason and reality (and, therefore, against man and values). If the conscientious attempt to perceive reality by the use of one's mind is the essence of honesty, no such rebellion can qualify as "honest." This is not very good reasoning. An idea cannot be inherently dishonest: only people can be dishonest. And it is not at all clear that anyone who holds false ideas, even obnoxiously false ideas such as Nazism and communism, must ipso facto be dishonest. Indeed, there are good reasons to believe that intellectual honesty has little to do with the ideas people hold. Most people really have no idea what it means to be intellectually honest. They engage in fatuous speculations quite innocently, without having a clue at how far they have wandered off the cognitive straight and narrow. Intellectual honesty requires an intelligent commitment to empirical criticism, experimentation, fact-checking, and openness to criticism, all of which are lacking, not merely with the human race in general, but within the folds of orthodox Objectivism as well, which uses ideas, not as symbols to interpret and gain insight into reality, but as shields to seal themselves up within the ideological constructs of Ayn Rand. How else can we explain Peikoff's strange descent into Harriman's anti-science physics? or his unwillingness to reform the Objectivist epistemology in the light of evidence brought forth by the Cognitive Revolution? Moral Relativism. There exists a great deal of confusion over the issue of moral relativism. Most people—including Rand and her followers—equate moral relativism with moral subjectivism, which is to say, with moral nihilism. While people can define terms as they please, it is important to note that, philosophically speaking, the most coherent account of moral relativism eschews the subjectivism of social relativists and instinctive hedonism. This brand of moral relativism assumes (in the words of Santayana) that the "only natural unit in morals is the individual man." Moral values arise out of the relation between natural dispositions and capacities of the individual on the one hand and the occasions for satisfying those dispositions in external circumstances on the other. Such dispositions, capacities, and occasions are all "objective" facts well beyond the control of subjective wishful thinking. But as these factors may differ from individual to individual, so moral values may differ from individual to individual. The good for Peter may not be identical to the good for Paul. This brand of moral relativism is the only morality fully consistent with naturalism. Its main alternative and rival is moral absolutism. The most coherent form of absolutism assumes the existences of a transcendent moral law imprinted on the universe by the will of God. Less coherent forms of absolutism have been attempted on secular grounds, but have not fared well. G. E. Moore and Bertrand Russell were the last big name philosophers to attempt a fully consistent secular form of absolutism in the opening decades of the twentieth century, but their ethical pretensions were decisively refuted by Santayana. Given Rand's vehement hostility to religion and the supernatural, we might expect her to be hostile to any form of moral absolutism. Unfortunately, she also despised any morality based on natural disposition, because such dispositions are emotional in content and therefore "irrational." She also assumed that an "objective" ethics must be a "universal" ethics, and that any ethics that was not universal must be "subjective," and hence morally abominable. She was also well aware of some of the shortcomings of absolutism, even in its secular guise, as her criticism of intrinsic morality demonstrates. So what was she to do? She decided, in effect, to embrace a form of moral eclecticism, drawing whatever features she liked from each system and then declaring, in her usual ex cathedra manner, that her morality constituted a third alternative which she called "Objectivism." The problem with doing this is that, without realizing it, she was throwing together incompatible elements. What Rand claimed of "intrinsic" moral theories is true of all absolutist theories. "The intrinsic theory," she wrote, "holds that the good is inherent in certain things or actions as such, regardless of any benefit or injury they may cause to the actors and subjects involved." But this is true all absolute moral theories. Once we begin talking about the consequences of moral actions and the benefits and injuries of individuals, we are speaking in relativist terms. Benefits and injuries can only be determined in relation to natural dispositions and capacities. Since these dispositions and capacities differ from individual to individual, they cannot play a role in any absolutist moral system. Rand's criticism of intrinsic moral theories borrows from and assumes moral relativism. It is not consistent with the absolutist and universalist strains in her system. Now Rand adopted several strategies to try to circumvent the contradictions that arose in her ethics as a result of her embrace of moral absolutism. To begin with, she adopted a standard of value destitute of ethical content. She asserted that the standard of value is man's life. But what could that possibly mean? Since most moral decisions have, at best, only a negligible and uncertain bearing on life, such a standard is not very useful. So Rand added the qualification "man's life qua man," or, as it is sometimes interpreted, man's life as a rational being—alas, an even vaguer standard! The practical effect of a vague standard is that you wind up with no standard at all. This allows one to surreptiously adopt some relativist standard (such as eudaemonism) while pretending all along to be an absolutist. Or, even worse, one can project a morality based on one's own moral dispositions on the universe at large, claiming that your values ought to be everyone else's. Another strategy Rand adopted to evade the difficulties inherent in moral absolutism was to qualify this absolutism by calling it "contextual." This is her most unequivocal concession to moral relativism—though only a partial one. Contextual absolutism embraces only one side of the moral equation: it admits that external circumstances play a role in formulating moral precepts. "Internal" circumstances—i.e., the natural dispositions and capacities of the individual—continue to be ignored and disparaged as "whims." For Rand, ethical conduct has to be (per impossible) controlled entirely by "reason." Hence the contradiction in the Objectivist ethics between the naturalistic strains in her thought and the absolutist strains. A naturalistic morality must be based on natural dispositions—on human nature in the traditional sense of the term. As Santayana put it: "Morality—by which I mean the principle of all choices in taste, faith, and allegiance—has a simple natural ground. The living organism is not infinitely inelastic; if you stretch it too much, it will snap; and it justifiably cries out against you somewhat before the limit is reached. This animal obstinacy is the backbone of all virtue, though intelligence, convention, and sympathy may very much extend and soften its expression." Is Rand in fact guilty of casting the livid colors of her own insanity upon nature at large? In one respect, yes, she was guilty. Rand's moral absolutism helped to justify her moralism, which will be the subject of my next post. Eudaemonism. 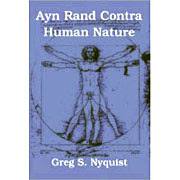 Objectivist morality is often described as a species of eudaemonism. Yet, oddly, Rand herself, although she sympathized with eudaemonism, could not bring herself to endorse it. She wrote, rather incoherently, "Happiness can properly be the purpose of ethics, but not the standard." This is an odd distinction. It arises from a central contradiction in Rand's morality: that is, from Rand's conviction that "reason" can determine moral ends. Happiness, for Rand, can never be the standard of morality because happiness is just an emotion, and to make emotion the standard of morality would constitute a surrender to the irrational. Eudæmonism is another name for wisdom: there is no other moral morality. Any system that, for some sinister reason, should absolve itself from good-will toward all creatures, and make it somehow a duty to secure their misery, would be clearly disloyal to reason, humanity, and justice. Nor would it be hard, in that case, to point out what superstition, what fantastic obsession, or what private fury, had made those persons blind to prudence and kindness in so plain a matter. Happiness is the only sanction of life; where happiness fails, existence remains a mad and lamentable experiment. The question, however, what happiness shall consist in, its complexion if it should once arise, can only be determined by reference to natural demands and capacities; so that while satisfaction by the attainment of ends can alone justify their pursuit, this pursuit itself must exist first and be spontaneous, thereby fixing the goals of endeavour and distinguishing the states in which satisfaction might be found. Natural disposition, therefore, is the principle of preference and makes morality and happiness possible. We know from cognitive science that Rand was wrong about emotions not being tools of cognition; and we know from Hume that Rand was wrong about deriving moral ends from reason alone. With this knowledge in hand, we can appreciate what strange circumlocutions Rand forced herself into by her false moral ideals. These jejune ideals led her to deny happiness as a standard of morality because happiness is an emotion—a mere "whim"! Informed that their natural dispositions were merely whims that could not be used to judge how they should act, many of Rand's followers in the sixties and seventies wound up repressing their emotions and, because they could not derive moral ends from reason alone, turned to the heroes of Rand's novels. But here, as Nathanial Branden has pointed out, they were given examples that led them astray. In Rand's novels, moral behavior is characterized "by ruthlessly setting feelings aside," while immoral behavior is characterized by headlong dive into "feelings and emotions." By denying the role of emotions in moral knowledge, Rand became, whether wittingly or not, a voice for repression and dishonesty about the self. It is from the prospect of pain or pleasure that the aversion or propensity arises towards any object: And these emotions extend themselves to the causes and effects of that object, as they are pointed out to us by reason and experience. It can never in the least concern us to know, that such objects are causes, and such others effects, if both the causes and effects be indifferent to us. Where the objects themselves do not affect us, their connexion can never give them any influence; and it is plain, that as reason is nothing but the discovery of this connexion, it cannot be by its means that the objects are able to affect us. Since reason alone can never produce any action, or give rise to volition, I infer, that the same faculty is as incapable of preventing volition, or of disputing the preference with any passion or emotion. This consequence is necessary. It is impossible reason could have the latter effect of preventing volition, but by giving an impulse in a contrary direction to our passion.... Nothing can oppose or retard the impulse of passion, but a contrary impulse.... We speak not strictly and philosophically when we talk of the combat of passion and of reason. Reason is, and ought only to be the slave of the passions, and can never pretend to any other office than to serve and obey them. Note here first of all that Hume describes the view that morality should be determined by reason as the dominant view in both ancient and modern philosophy. In other words, Rand is hardly the first philosopher to support a reason-based morality. Also note Hume's rejection of the traditional view that sees passion and reason as potentially at odds. No, contends Hume, they are not at odds. Passion (or emotion) serves as the motivation for reason. Passions provide the ends, and reason tells us the means by which those ends can be attained. Hume's argument in the Treatise is a bit obscure to modern readers, so it helps to supplement it with passages from a later work. In Hume's An Inquiry Concerning the Principles of Morals, he explains with greater clarity the impossibility of a morality solely based on reason. It is easy for a false hypothesis to maintain some appearance of truth, while it keeps wholly in generals, makes use of undefined terms, and employs comparisons, instead of instances. This is particularly remarkable in that philosophy, which ascribes the discernment of all moral distinctions to reason alone, without the concurrence of sentiment. It is impossible that, in any particular instance, this hypothesis [of a reason-only morality] can so much as be rendered intelligible; whatever specious figure it may make in general declamations and discourses. Examine the crime of ingratitude, for instance; which has place, wherever we observe good-will, expressed and known, together with good offices performed, on the one side, and a return of ill-will or indifference, with ill-offices or neglect on the other: Anatomize all these circumstances, and examine, by your reason alone, in what consists the demerit or blame: You never will come to any issue or conclusion. Reason judges either of matter of fact or of relations. Enquire then, first, where is that matter of fact, which we here call crime; point it out; determine the time of its existence; describe its essence or nature; explain the sense or faculty, to which it discovers itself. It resides in the mind of the person who is ungrateful. He must, therefore, feel it, and be conscious of it. But nothing is there, except the passion of ill-will or absolute indifference. You cannot say, that these, of themselves, always, and in all circumstances, are crimes. No: They are only crimes, when directed towards persons, who have before expressed and displayed good-will towards us. Consequently, we may infer, that the crime of ingratitude is not any particular individual fact; but arises from a complication of circumstances, which, being presented to the spectator, excites the sentiment of blame, by the particular structure and fabric of his mind. This representation, you say, is false. Crime, indeed, consists not in a particular fact, of whose reality we are assured by reason: But it consists in certain moral relations, discovered by reason, in the same manner as we discover, by reason, the truths of geometry or algebra. But what are the relations, I ask, of which you here talk? In the case stated above, I see first good-will and good-offices in one person; then ill-will and ill-offices in the other. Between these, there is the relation of contrariety. Does the crime consist in that relation? But suppose a person bore me ill-will or did me ill-offices; and I, in return, were indifferent towards him, or did him good-offices: Here is the same relation of contrariety; and yet my conduct is often highly laudable. Twist and turn this matter as much as you will, you can never rest the morality on relation; but must have recourse to the decisions of sentiment. When it is affirmed, that two and three are equal to the half of ten; this relation of equality, I understand perfectly. I conceive, that if ten be divided into two parts, of which one has as many units as the other; and if any of these parts be compared to two added to three, it will contain as many units as that compound number. But when you draw thence a comparison to moral relations, I own that I am altogether at a loss to understand you. A moral action, a crime, such as ingratitude, is a complicated object. Does the morality consist in the relation of its parts to each other? How? After what manner? Specify the relation: Be more particular and explicit in your propositions; and you will easily see their falsehood. No, say you, the morality consists in the relation of actions to the rule of right; and they are denominated good or ill, according as they agree or disagree with it. What then is this rule of right? In what does it consist? How is it determined? By reason, you say, which examines the moral relations of actions. So that moral relations are determined by the comparison of actions to a rule. And that rule is determined by considering the moral relations of objects. Is not this fine reasoning? All this is metaphysics, you cry: That is enough: There needs nothing more to give a strong presumption of falsehood. Yes, reply I: Here are metaphysics, surely: But they are all on your side, who advance an abstruse hypothesis, which can never be made intelligible, nor quadrate with any particular instance or illustration. The hypothesis which we embrace is plain. It maintains, that morality is determined by sentiment. It defines virtue to be whatever mental action or quality gives to a spectator the pleasing sentiment of approbation; and vice the contrary. We then proceed to examine a plain matter of fact, to wit, what actions have this influence: We consider all the circumstances, in which these actions agree: And thence endeavour to extract some general observations with regard to these sentiments. If you call this metaphysics, and find any thing abstruse here, you need only conclude, that your turn of mind is not suited to the moral sciences. It appears evident, that the ultimate ends of human actions can never, in any case, be accounted for by reason, but recommend themselves entirely to the sentiments and affections of mankind, without any dependance on the intellectual faculties. Ask a man, why he uses exercise; he will answer, because he desires to keep his health. If you then enquire, why he desires health, he will readily reply, because sickness is painful. If you push your enquiries farther, and desire a reason, why he hates pain, it is impossible he can ever give any. This is an ultimate end, and is never referred to any other object. Now as virtue is an end, and is desirable on its own account, without fee or reward, merely, for the immediate satisfaction which it conveys; it is requisite that there should be some sentiment, which it touches; some internal taste or feeling, or whatever you please to call it, which distinguishes moral good and evil, and which embraces the one and rejects the other... Reason, being cool and disengaged, is no motive to action, and directs only the impulse received from appetite or inclination, by showing us the means of attaining happiness or avoiding misery. Rand either never read these passages in Hume or, if she did read them, she failed to understand them. If reason is perceived as a method by which matters of fact and relations are grasped and elucidated, how can a mere method generate a motive, let alone a moral end? Reason is but an intellectual tool; and since tools don't generate motives, but are merely methods or means by which some end is attained, something outside of reason, some appetite or passion or intention, must motivate reason to get it to do its thing. Rand's failure to grasp this led her to attempt the impossible: to create a morality based solely on "reason." And since, as Oakeshott reminds us, "to try to do something which is inherently impossible is always a corrupting enterprise," so Rand's so-called rational ethics terminates in what can only be described as a rationalistic moral code, where reason becomes a mere euphemism for casuistry. Conclusion. Having briefly run through some of the major challenges posed by the Cognitive Revolution to orthodox Objectivism, a recapitulation of the main points would be in order. 1. Rand's blank slate view of human nature, particularly her denial that human choice (i.e., free will) is not "saddled with tendencies," is not a plausible position. 2. There is no compelling evidence to support Rand's assertion that emotions are a product of an individual's premises. 3. The Randian view that nothing gets in the "subconscious" without first being in the consciousness is grossly implausible, and about as scientifically creditable as the view that the earth is flat. 4. Rand greatly exaggerates the role that consciousness plays in concept-formation, leading her to place far too much importance on definitions and other trappings of formalized, conscious thinking. 5. Wittgenstein's "family resemblance" theory of concept demonstrates the poverty of Rand's classical view of concepts. 6. Rand's view that "Reason is man's only means of grasping reality and acquiring knowledge" is falsified by the overwhelming evidence for intuitive forms of thinking (such as Oakeshott's "practical knowledge"), which do not use "reason." 7. Rand's view that "Emotions are not tools of cognition" are falsified by cutting edge research by neuroscientist Antonio Damasio. 8. Rand's belief that epistemological truth is best attained through introspection is refuted by the view, common in the cognitive science world, that "unconscious thought is 95 percent of all thought." Introspection, then, would only have access to 5 percent of thought! Not a good vantage point for understanding human cognition! 9. Since most of human thought is hidden from introspection, anyone who claims to understand cognition from their introspective observations is talking through their hat; and any epistemology found on such slim pickings must, ipso facto, be largely speculative. This is the major problem with Randian epistemology. It is mostly speculative, rather than empirical and scientific. Rand is not an authority on human cognition. Cognitive scientists, who study human cognition empirically, using scientific methods of research and the rigorous system of peer review to catch errors, are likely to know a great deal more about cognition than Rand. 10. The cognitive unconscious and the important role of tacit, intuitive knowledge constitutes a huge blow to foundationalism, which is so central to Objectivism, particularly to the Objectivist theory of history. Non-verbal forms of knowledge, which form a critical component of human knowledge, cannot be proved or validated or deduced from axioms or from basic truths. Having refuted the worst of Rand's epistemological pretensions, we can now examine some of the other parts of her system with greater depth and insight. Among the many lessons that can be drawn from the Cognitive Revolution, perhaps the most important has to do with the inevitable conflict between Objectivist methodology on the one hand and the understanding of human nature on the other. Human nature is a family resemblance concept which is partially based on tacit, intuitive knowledge. Consequently, no detailed and practically effective understanding of human nature can be achieved through the sort of "reason" based essentialism advocated by Rand. The Objectivist definition of man as a "rational animal" provides no real insight into human nature and could not be used as a reliable guide in predicting how people are likely to behave in a given situation. There are individuals in politics, in business, in law enforcement, in the criminal underworld who are very savvy at guessing the probable behavior of strangers in special circumstances. This knowledge is very useful and gives them an advantage in the competition for preeminence in society.